Obama made clear majority will be "inclusive," but minority has to be "constructive"
WASHINGTON (CNN) -- Sure, it was a tad hokey and staged. After members of Congress and assorted good government-types participated in the "fiscal responsibility" summit at the White House, President Obama took their questions. 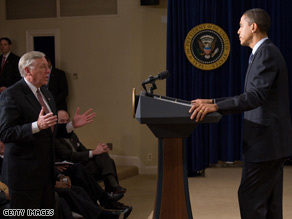 Rep. Steny Hoyer, D-Maryland, speaks after Obama called on him at the fiscal summit's closing session. Calling first on Sen. John McCain, the new president was almost scolded and told his new fleet of helicopters will cost "as much as Air Force One." Obama, however, was quick to agree: "My helicopter now seems perfectly adequate to me." Of course, he added, "I've never had a helicopter before." The audience loved it. All of which was the point, at least from the White House point of view: Open up this session, let the president take questions. Let the voters see he's engaged on the cutting side of the budget as well as on the spending side. But there was more to this open session, and it wasn't about the numbers. It was about the tone of the presidency, about opening up the doors of the White House and the lifting of the veil on how government works (or doesn't) work. And no matter how polite, it was refreshing to watch an American president engage his opponents, much as a British prime minister does in his parliamentary question-and-answer sessions. After all, we're used to the rat-a-tat-tat of campaign engagements; this intellectual discourse is going to require some adjustment. Campaigns are for bumper-sticker solutions. This session was all about letting the public in on the complexities of budget-cutting, or rescuing Social Security or expanding health care. So questions were taken about the need for Congress to have the will (and the courage) to take on sacrosanct entitlement programs such as Social Security or Medicare. Some even mentioned the need to (gulp) raise taxes to solve some of these problems. The president announced an upcoming health-care summit -- a key indication he believes that the growth in the cost of health care is a giant problem that will stunt economic recovery. Indeed, as a senior White House adviser tells me, "Fixing health care is the single biggest thing we can do to improve our economic picture." And speaking of tough, Obama also made it clear he's still reaching out -- to a point. The majority is willing to be "inclusive," he said, but that means the minority also has to be "constructive." Obama will keep talking, both to the GOP and to the American public. At some point, the voters will get to decide who is being more constructive. My bet is they go with the fellow who at least looks like he's trying to solve their problems.